يقع في Sydney CBD, شقق فريزر سويتس سيدني إنه المكان الأنسب لاكتشاف سيدني و ما يحيطها. يحظى هذا الفندق ذو 5 نجمات بمكان ممتاز يسمح بالوصول إلى المعالم السياحية الأكبر في المدينة، فهو يبعد مسافة 0.1 km عن صخب المدينة. بالنسبة لمن يريد الخروج، هذه بعض المعالم السياحية المتوفرة للزوار Paddy Pallin, كاثدرائية آندروس, اتش اس بي سي. إن شقق فريزر سويتس سيدني حريص على توفير الراحة للنزلاء، فلا يوفر الموظفون جهداً في تقديم أفضل الخدمات وضمان حسن الاستقبال. يمكن الاستمتاع بمجموعة من الخدمات على أعلى المستويات في الفندق كمثل واي فاي مجاني في جميع الغرف, مكتب الاستقبال على مدار الساعة, مرافق مخصصة لذوي الاحتياجات الخاصة, تسجيل وصول/خروج سريع, تخزين الأمتعة. في شقق فريزر سويتس سيدني غرف نوم يزيد عددها عن 201 صممت بذوق وعناية لتوفر لك كل وسائل الراحة . بعضها يحتوي أضاً على تلفزيون بشاشة مسطحة, مرآة, غرفة معيشة منفصلة, اتصال لاسلكي بالإنترنت, اتصال لاسلكي بشبكة الإنترنت (مجاني). يقدم الفندق خدمات رائعة كمثل حوض استحمام ساخن, مركز للياقة البدنية, ساونا, حمام سباحة داخلي لمساعدتك على الاسترخاء بعد نهار طويل من النشاط والتجوال في المدينة. إن شقق فريزر سويتس سيدني هو خيار ذكي بالنسبة للمسافرين إلى سيدني، بما يوفره من إقامة هادئة ومرحة. يُرجى العلم أنه ينبغي على النزلاء تقديم بطاقة هوية تحمل صورة سارية ونسخة من الحجز عند تسجيل الوصول. يجب تقديم تصريح مسبق باستخدام بطاقة الائتمان لمبلغ 300 AUD عند تسجيل الوصول كسند تأميني للتكاليف العارضة. يتوافر مكان لانتظار السيارات ذاتي الخدمة مقابل 50 دولار أسترالي للسيارة في اليوم الواحد. يتوافر مكان لانتظار السيارات مع خدمة صف السيارات مقابل 60 دولار أسترالي للسيارة في اليوم الواحد. the staff at front desk not friendly especiall the person who check me in. i can t stand her facial expression when i ask for early check by ealier . told the hotel fully book when the truth it is hardly full.when you have child travelling you should be considerate abit epecially if person had long flt. never would comeback to this hotel.i should stay at merition instead which was next door.they have the best hospitallty from the time you check till you check out. A comfortable hotel with good facilities. What stands out most is the very friendly and helpful staff. I'd like to make a special mention of Hani, who went out of her way to make our stay comfortable. We got the room at a discounted rate - it was good value at the discounted rate. Stay for 7 nights with 2 separate booking, 1 deluxe & 1 executive but end up stay in executive room, thanks for free upgrade. bought executive room darling harbour view for New year eve from agoda (with picture of corner room), got only slight view of darling harbour but high floor. Staff said corner room full booked. Enjoy all my stay and everything was fine. Also got high chair for my baby. However, Poor cleaning service when check out, left my international adaptor attached in the kitchen & perfume in bathroom. Came back to check but they said staff didnt find them in the room. The fact that we left the items (not much) & staff has checked thoroughly before new guest came made us left with bad reputation to the hotel’s room service. Our suite was very nice indeed. Large, well equipped and comfortable. There is no residents bar and I guess there isn’t supposed to be, being a “suites” offering, so I won’t knock them for that, I’ll just be mindful of checking in advance. Great places and good helpful staf. Stored our luggage safely for the day, allowing us to walk to Darling Harbour and then to the opera house for sightseeing before leaving. No complaints at all. The location is in the center of the city, easy to go to different visiting places. The room is in good size with full kitchen wares. However, the room is not clean enough, the fridge is dirty and even the washroom has some dirt! There is a strong aroma which was not pleasant for us. 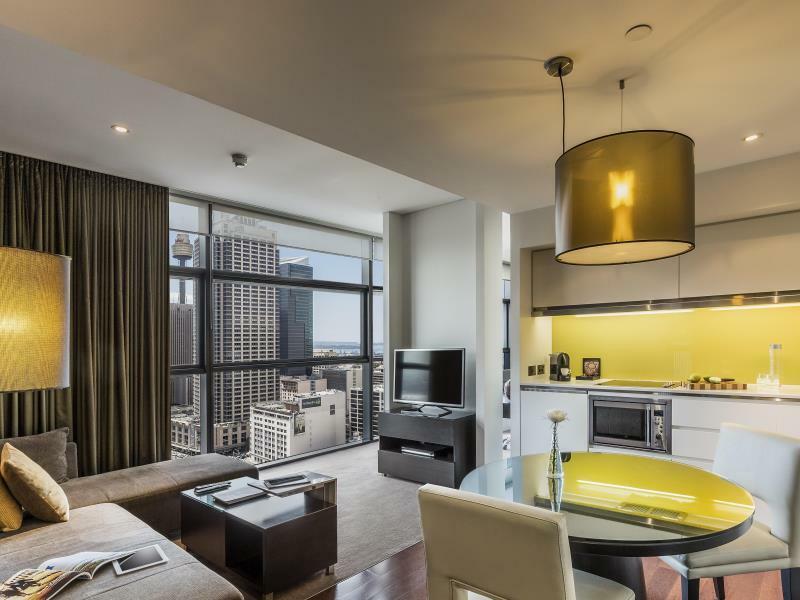 Overall, the hotel needs renovation for a higher quality. I don't use this venue frequently but am always happy when i do. 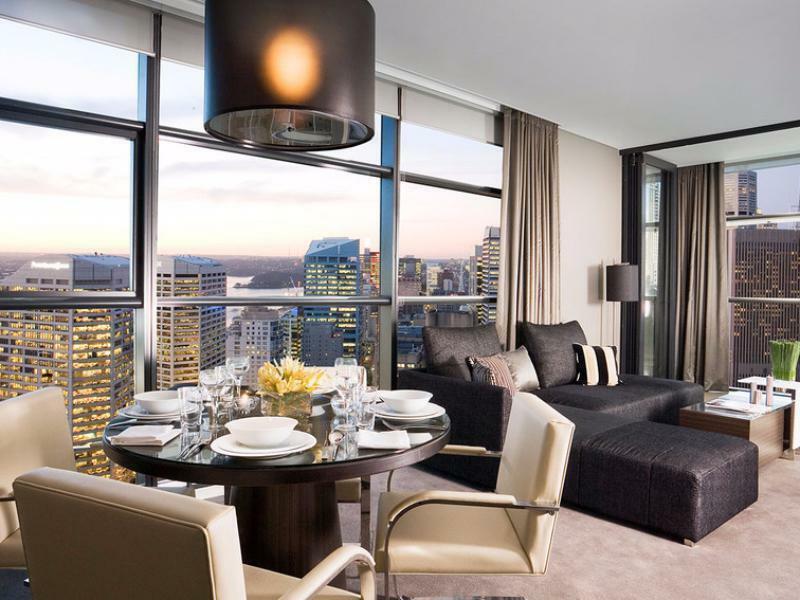 It's in a great location central to everything and suites are some of the best in Sydney. Pricing this trip was high but Sydney was flooded with cruise ships who's patrons all had a night a shore and hence accomodation was tight. Great location, comfortable and clean room. WiFi speed was good. Water pressure was good. Walking distance to eateries, shopping and train station. Always my first choice when I travel to Sydney for business trip. The hotel location is good, near to inside city. 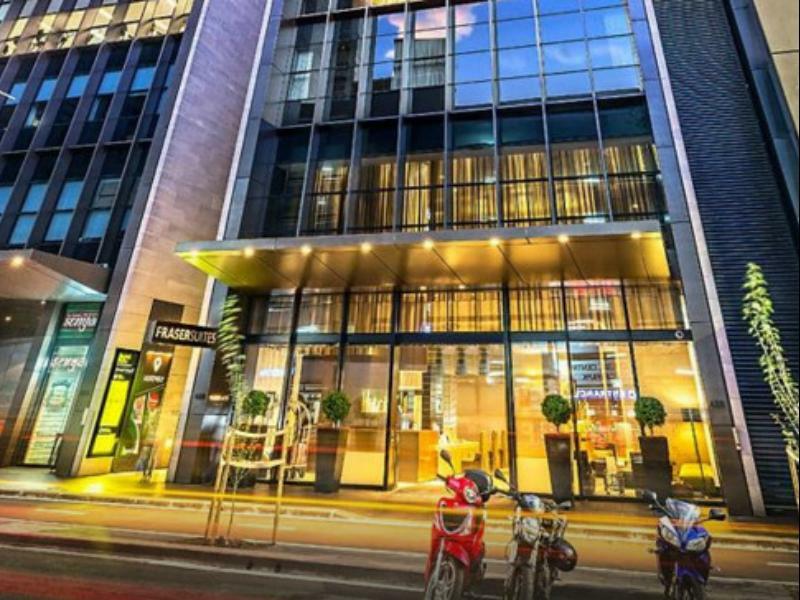 There are a lot of shop nearby and also near to train station which is the best for this hotel. Besides, the room are consider spacious and the water pressure are excellent. On day of arrival was informed the pool was under renovation so if i wanted to use the pool i had to go to another building...not a great start for humid weather. However check in staff was pleasant and helpful. Good facilities in the room provided. Attention to details in the suite was a little disappointing . One pair of slippers had dirty stuff trapped in the packaging- i left it out for them to see but it was still there till i checked out. Tidy up of robes not done. Just left on bed. The packet of milk was opened and used but it was replaced when i later called down. on the 4th day onwards i left the room at 10am and room still made up till past 5pm. I asked front desk when i came back around 3ish pm and they said they would call Hskpg but when i came back at 5pm...it was still not done. When they finally came 1/2 and hour later i just asked for a change of towels. Same thing again the next day except they came at 4pm and daily i left the hotel at 10am and came back around 4pm. Excellent stay at Fraser Suites, would highly recommend. The service was exemplary and the facilities in the room were really good too. Lots of lovely restaurants on the doorstep and only a 5 minute walk to Darling Harbour. I paid for two nights with extra bed. But the hotel didn’t provide the bed for the first night. Asked for refund for the extra bed for the first night, hotel refused. They only can provide me late check out or free breakfast for the last day. However, I explained to staff, I’m the single mum travel with two two little kids and need catch the flight early in the morning, and I don’t need late check out and also, it’s hard for me to have breakfast with two little kids in the early morning. But the hotel still refused to refund the $65 to me. As the staff said they didn’t know I didn’t recieve the bed for the first night. However, everything I on the confirmation letter!! If they didn’t know, how can they put the bed into my room for the second night! ! It’s the second time I stay with the hotel, won’t come back again! I only stayed at this hotel one night before heading back to the states. This is an excellent hotel (my room was pretty much a one bedroom suite with a living room, kitchen and dining room). I arrived at the hotel early Sunday morning, my room was not available yet but I was given access to the floor where the gym and pool is located and was able to take a shower and freshen up. The service at this hotel was excellent, everyone was friendly and helpful and made me feel welcomed. 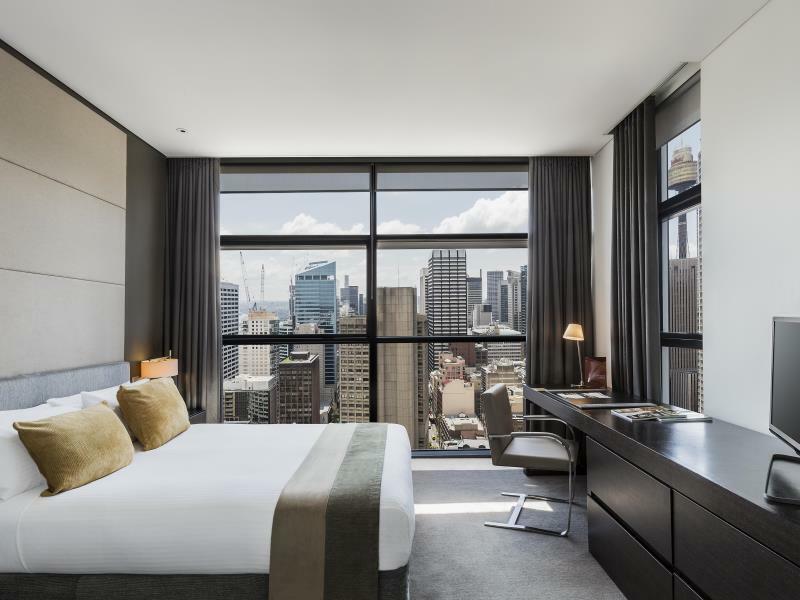 The location of the hotel is excellent, there is a food court right next door and you are a short five minute walk to to Queen Victoria Building, Pitt Street Mall and Westfield shopping center. I would like to say, I was leaving the next morning and I booked a shuttle that never showed up, they were quickly to help, flag down a taxi so I can get to to the airport on time. They went above and beyond and was very helpful. If I'm every in Sydney again, I will most definitely stay at this hotel again. A return guest and will definitely choose this hotel again for my next stay. The staff is very friendly and helpful. Quick check-in and check-out process. Room was comfortable, clean and spacious. WiFi speed and shower water pressure was good. Room service was good but they don't serve drinks which is a drawback. Close to train station, eateries and shopping. Overall I am very satisfied with this hotel. 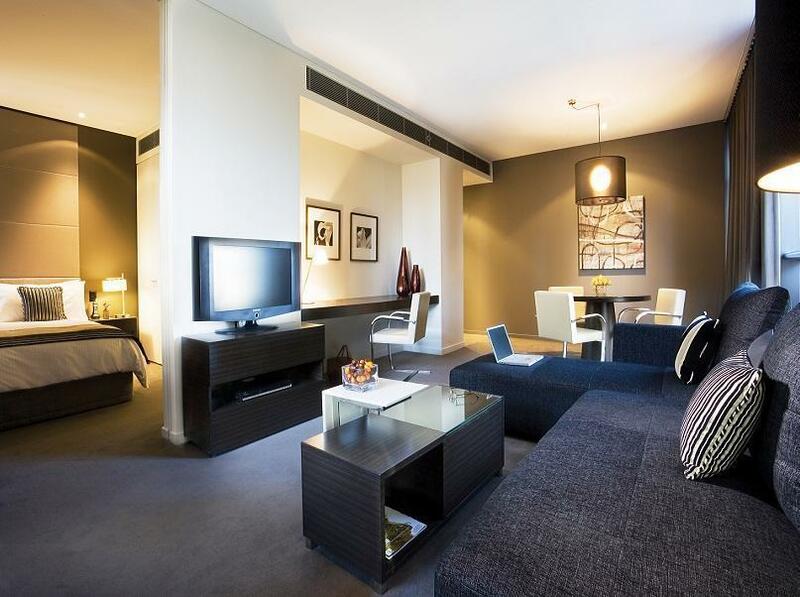 The staff at Fraser Suites Sydney are very professional and everything is as expected. The only disappointment was the much smaller room - I was visiting for the second time and was a bit surprised how cramped the room was. The bed is small and have wheel so move Very easy then when move yourself at night feel bed move and uncomfort to sleep.bed and bedsheet clean but window and outside room need to be more clean. Look like hotel quite old. Paid about $250 per night but if bring car to park charge more $52 I think too expensive should have guest rate. Service was great from the minute I checked in to the moment I left. The rooms are well appointed, clean and of 5 star quality. Would highly recommend and will be back. Very glad I have discovered this hotel group for my future travels.